There's a deep divide going on right now and it's all thanks to the late Sam Panopoulus. His name might not be well known, but his invention certainly is. The Greek-born, Canadian chef was experimenting in the kitchen with his brothers when they decided to try putting pineapple and ham on a pizza and a legend was born. Panopoulus passed away in June of this year, but his creation is still causing controversy. Not everyone thinks that Panopoulus's Hawaiian pizza was a good idea. In fact, many seem to think that it's one of the most heinous creations to ever see the light of day. It's almost hilarious how strongly some people hate pizza with pineapple on it. These folks just can not get into the idea of fruit on pizza. Like this girl, who dedicated her senior yearbook quote to letting her classmates know just how much she despises the vile creation. Or this pizza guy that just COULD NOT bring himself to even make the abomination that is pineapple pizza. Of course, there are people who live on the complete opposite of the spectrum and, this being the internet, those people defend their favorite topping with a passion that some might call over-the-top. These people absolutely don't care for the people who tell them what they can and can't have on their pizza and they're not afraid to voice their love for their preferred topping that everyone else so enjoys crapping on. As one Twitter user who saw the delectable creation as the ultimate form of freedom in such a cruel world with unjust oppressors. Or this Twitter user who knows that not sharing in the appreciation for the ultimate pizza topping is the catalyst for cutting ties with friends in a drastic fashion. In the battle of the pineapples, the only unacceptable opinion is not having one in the first place. Either you're for or against this particular topping, there's no room for wishy-washy centrists who can't make up their mind. Pick a side or get out of the fight! The battle rages on and it doesn't seem like anyone will be reaching a consensus anytime soon. It's the age old fight between sweet and savory, and that battle is one that will never end. 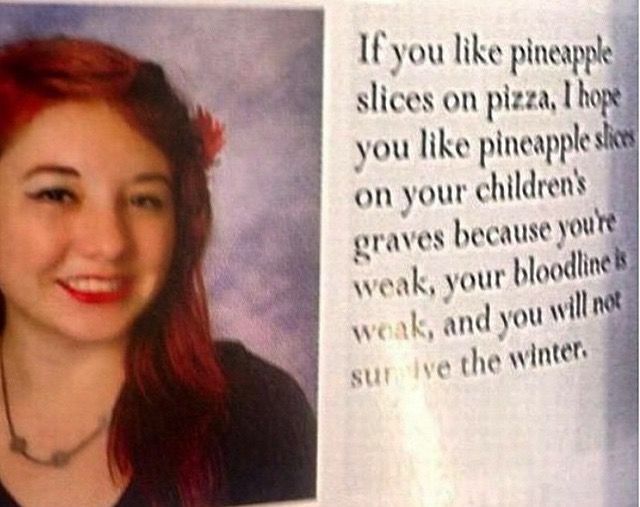 Where do you fall on the pineapple pizza fight? Are you a lover of all things sweet and fruity, or do you stick to the traditional savory? Sound off in the comments!